When SheaMoisture came out with a Professional line we were excited to try it - all three lines of it. So we asked our curlfriend Tiffany Nicole, a natural hair care stylist and pro extensionist, to show us how the new lines are used. She gave makeovers to Uma, Nikki and Amanda at her salon, catering to each of their hair concerns. If you're curious about trying the SheaMoisture Professional line yourself, you can find it at Sally Beauty Supply. Ever since coloring her curls Uma's been worried about dryness and damage, especially at the ends, so Tiffany used the Color Care Collection on Uma. 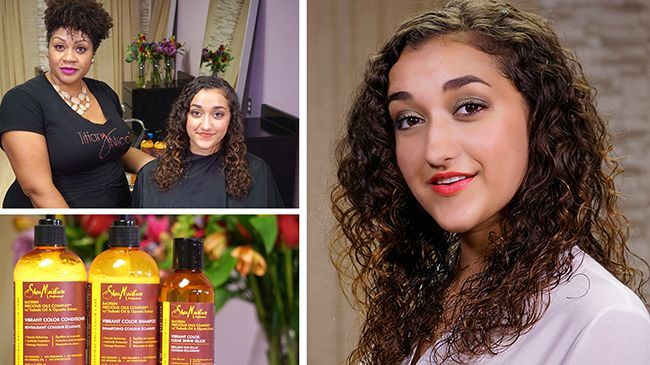 We don't want fear to keep you from trying new colors or curl enhancing highlights, so here are some tips for moisturizing colored curls. Step 1 - Tiffany used the Vibrant Color Shampoo and Conditioner because of its fade-resistant protection and pH balancing properties to seal Uma's cuticles and protect the color from washing out. Nikki wears her hair in a fabulous curly wash and go most days of the year, but once or twice a year she likes to change it up and wear it straight, just for fun. Of course the fun is never worth it if it's followed by damage of any sort, so she asked Tiffany to keep her curls safe with the Keratin Care Collection. Step 1 - Nikki wanted to know if it's best to co-wash or shampoo before straightening, and Tiffany said that shampooing is definitely the way to go. It is important to remove all product buildup from the hair before running the heat of the straightening iron over it. Step 2 - The KeraVega Monoi Oil Complex Conditioner helped to moisturize Nikki's hair and provide heat protection to prevent heat damage. Step 3 - On freshly cleansed and conditioned hair, Tiffany applied a small amount of the Smooth Finish Blow Dry Cream throughout Nikki's hair, followed by the Smooth Finish Thermal Protection. Step 4 - Blow dry the hair straight and if you're going for a super straight look, finish off with a flat iron. When Nikki blow dries her hair she usually and skips the flat iron for lots of volume and body, so it was a total surprise when Nikki walked into the office with completely straight hair - and we were all relieved when her curls came back afterwards, damage-free. Amanda has mastered the wash and go, but she wanted to get a few twist out tips because she experiences a lot of shrinkage during the week when she does a twist out herself. Tiffany whipped up a personalized curl cocktail to keep Amanda's twist out elongated. Step 1 - Tiffany shampooed Amanda's hair twice, first with the Clear Start Shampoo and then the Moisture Infusion Shampoo. Read our article here about the importance of the double shampoo method. Step 2 - Then Tiffany mixed a personalized cocktail using the Natural Pro Curl Care Rehydrating Cocktail Mix with a moisturizing masque and intensive oils to seal in Amanda's moisture. Step 3 - Amanda sat under the dryer with her conditioning treatment and a shower cap so that the conditioner and intense oils could penetrate her hair with the help of heat. Step 4 - Tiffany applied the Blow Dry Cream (because it's ok to mix products from different lines) throughout Amanda's hair and blow dried it in small sections to stretch it. Step 5 - When Amanda's hair was blown out, Tiffany applied the Curl Memory Leave-In Conditioner and a few drops of the Vibrant Color Clear Shine Glaze for shine and manageability in the twist out. Step 6 - Tiffany twisted Amanda's hair and she sat under the dryer for 30 minutes allowing it to dry. Then Tiffany untwisted the style, except for a small section on the right side for a sideswept look. Have you tried any of the SheaMoisture Professional products? Let us know what you thought in the comments!